Melinda Bilyeu, Hector Cook, Andrew Môn Hughes, with Joseph Brennan and Mark Crohan. Bee Gees: Tales of the Brothers Gibb. London, New York : Omnibus Press, 2000. The most complete biography available of the group and containing contributions by the creator of this web site. An independent book not ‘authorized’ but done with no known objections from the group during its creation and with limited cooperation from their management. It includes over one hundred new interviews with people who have worked with or otherwise knew the Gibb brothers, and collects information from many hundreds of previously published and sometimes obscure press clippings. After publication the Bee Gees complained about it. David Leaf. Bee Gees: The Authorized Biography, by Barry Gibb, Robin Gibb and Maurice Gibb. New York : A Delilah/Delta Special (publishers), 1979. The authorized bio, now quite old, written with insider access to the group. While content was under the Bee Gees’ control, it is remarkably candid about many aspects of their lives and careers not previously known. Even after the 2000 biography, this is still well worth obtaining especially for the photos. It includes a discography and song list by Saul Davis. David English. The Legend: The Illustrated Story of the Bee Gees. Illustrated by Alex Brychta. London, Melbourne, New York : Quartet Books, 1983. In some ways this joke-filled cartoon version of the Bee Gees’ career captures the feel of their lives better than any other account. David English was a good friend of Barry by this date and knew the score. David Dasch. ‘The Bee Gees Story’. In Rockin’ Aware, 1979. (Discography). A pioneering discography of the Bee Gees. Norbert Lippe (translated by Gary Felton). ‘Bee Gees: Their Story, Their Records’, in Goldmine, February 1984. (Discography) Includes B sides and other rarities. Peter Doggett. ‘The Bee Gees, 1962-1967’, in The Record Collector (London), issue 85, September 1986. (Short discography) This was superseded by the 1995 article by Hector Cook et al (below). Mike Grant. ‘The Bee Gees, 1967-1975’, in The Record Collector (London), issue 100, December 1987. (Short discography) This is a nice summary of releases during this period. The logical followup for later years never appeared. Beth Kujala and Manfred Baumann. ‘The Bee Gees: Their Early Compositions as Recorded by Australian Artists’ in Goldmine, 20 April 1990. (Discography) This article indirectly led to the Assault the Vaults CD in 1998. The commentary on the songs is still good reading. Hector Cook, Andrew Môn Hughes, Melinda Bilyeu. ‘The Bee Gees’, in Australian Record Collector, 1995. (Detailed Australian discography) Mostly superseded by the same writers’ biography in 2000. Michael Henkels. Bee Gees: die Superstars die 70er Jahre. Hamburg : Taurus Press, 1979. Contains much detail about the 1960s as well, some of which has not appeared elsewhere, so worthwhile if you read German. Vernon Joynson. The Tapestry of Delights. Glasgow : Borderline, 1998. (Revised edition, The Tapestry of Delights Revisited. London : Borderline, 2006.) Information about British psychedelic, beat, and progressive bands 1963-1976. K D Tilch. Rock-LPs. Hamburg : Taurus Press, 1984. (Discography) There are later editions. K D Tilch. Rock-musiker. Hamburg : Taurus Press, 1988. (Discography) There are later editions. Michel Ruppli. Atlantic Records: a Discography. Westport CT : Greenwood Press, 1979. U S Library of Congress, Copyright Office. Register of Copyrights. Various titles and series 1963-1981. Not published after 1981. U S Library of Congress. Online catalog at locis.loc.gov, database of copyright entries from 1979 to the present. Jim Barnes, Fred Dyer, Stephen Scanes. The Book: contains 30 years of Top 40 chart history. . .. Seven Hills, NSW, Australia : Top Forty Research Services, 1986. (Charts of one radio station in New South Wales) There are later editions not available to me. George Crotty. The Australian Festival Record Company: the label listing of singles released in Australia between 1961 - 1969. [Australia, n.d.]. A list of records by catalog number, highly useful in establishing dates for obscure releases. Tim Rice. Guinness Book of Hits of the 60s. Enfield, England : Guinness Superlatives, 1984. Jonathan Rice, Paul Gambaccini, Tim Rice. British Hit Singles. Enfield, England : Guinness Superlatives, 1991 (and later editions). Joel Whitburn. The Billboard Book of Top Forty Hits. New York : Billboard Books, 1992 (and later editions). Bee Gees Quarterly, fan club newsletter. No longer published. Special thanks to Mark Crohan for generously sharing his ongoing research from interviewing Australian artists over the past several years. Special thanks to Andrew Môn Hughes who has shared so much of his extensive research for the ‘The Singers Sang Their Songs’ project, and to him, Hector Cook, Melinda Bilyeu, and Mark Crohan once again for the wonderful experience of working on the biography together in 1999 and 2000. Never to be forgotten. Thanks to Manfred Baumann, Norbert Lippe, and Jostein Hansen for a careful reading of the whole document in the late 1990s and the addition of many, many details. 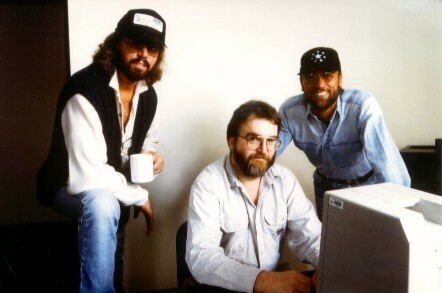 Very special thanks to Chris Mathis for running the Words email list since May 1996, providing a much-needed forum for fans to discuss the Gibb brothers and their music in endless detail. To a considerable degree my opinions and choice of emphasis here were influenced by the many discussions Chris has made possible through the list. Not that fans agree about what’s great and what’s not. That’s the fun part. Thanks also to Anne Berit Groenbech, Rick Tindall, Cheri Gottfried, Jenny Chor, Beth ‘Possum’ Kujala, Patrick Denny, Steven Johnson, Kazue ‘Melody’ Ishiwata, Blue Weaver, Joey Spain, Kathy ‘TittyTat’ Gray, Tore Eriksen, Morten Børsum, Mark Easter, Bo Mikkelson, Diane Weidenkopf, Victor Montaperto, Julian Glass, Joe Mannion, Kelli Hartman Daves, Terri Bridge, J M Tan, Noel Farry, Roy Wringer, Saul Davis, Ronnie Olsson, George Ashi, Tim Neely, Robin Setty, Rejane Hinkle, Göran Nilsson, Lorin Cole, Toni Quintana, Albhy Galuten, Tom Dowd, Bill Inglot, Jimmie Haskell, Vern Godfrey, Ann Grootjans, Andrew Sandoval, Richard Green, Robert Amram, Clement Ruiz Dalmau, Richard O’Donoghue, Benjamin Sumner, Peter Hammerton, Norman Hitchcock, Jimmy Stevens, Don Black, Richard Achor, Mike G Smith, Duane Hitchings, Phil Coulter, Bill Casey, Jeff Joseph, Abul Islam II, Angel Delgado, Marty Hogan, Meir Zarad, Gérard Groux, Sal Compoccia, Freddy Cools, Colin Harris, Gary Shepherd, Julio César Guzmán de Arcenegui, Todd Lacey, Yakima Canutt, and Kyle Huang for more information from correspondence, as well as possibly one or two other people I have forgotten to add to this list (and please remind me if I did forget you). Thanks to Bill Levenson for generously sharing information in his files at Universal. Special mention to the Bee Gees World website (now gone) for providing a thorough archive of Bee Gees information. Thanks to Kevin McManus and Columbia magazine for making possible the photos of me with Barry and Maurice, taken 25 March 1996 at the Hit Factory in New York by Lynne Saville. See below. Thanks to Hazel Shacklock neé Gibb for loaning me a pen to sign autographs in Walsall in October 2000, which I failed to return and have now used to sign the Introduction of these pages for good luck. I owe you one. A pen, that is.